Fuerteventura Guide. Flights to Fuerteventura. Hotels in Fuerteventura. 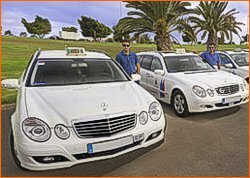 Rentacar - Taxi - Bus in Fuerteventura. Fuerteventura offers all possibilities to move around the island, whether renting a car, or traveling by taxi or bus network that connect the different parts of the island. If you opt for a rental car, getting around Fuerteventura is easy because the road network is not very complicated, but there are stretches of road that are not well enough to do so with complete safety. Taxi companies in each municipality provide transportation affordable prices throughout the island, including some tourist routes at a predetermined price. Car Rental: In the same Fuerteventura Airport, major car rental companies have offices. Besides international companies Hertz and Avis, you can rent a car in one of the three largest companies in the Canaries: CICAR AUTOREISEN and PAYLESS, which also have offices at the airport, offices in all the resorts, as well as being present in some hotels. Apart from these companies with permanent office at the airport, there are many small local car rental, which can deliver the car at the airport: Faycan, PEPECAR, AUTOS MORENO, Europcar, RECORD, etc..
With a single car will have enough to travel around the island, but if you can afford it, hire a 4x4 and you'll discover the most beautiful and remote places of the island, where access is possible only by dirt tracks. Rate * of 6.00 to 22.00, weekdays: kilometer or fraction: 0.53, jump value: 0.05 €, minimum of perception: 3.05, price per hour of waiting, 14.53 and price per fraction every 15 3.60 minutes. Rate * of 22.00 to 6.00 and holidays all day kilometer or fraction: 0.60 minimum perception: 3.35, price per hour of waiting, 14.53 and price per fraction every 15 minutes 3.60. 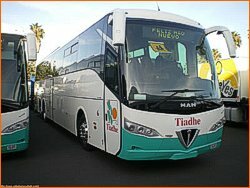 Bus: Thiadhe, The Regular Bus Company has fifteen lines connect the different towns of Fuerteventura. They have 30 modern air-conditioned buses, easy to move around Fuerteventura.